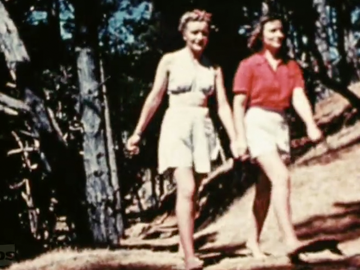 This National Film Unit travelogue, produced for the NZ Government Department of Tourist and Health Resorts, finds post-war Auckland basking in sunshine. Flowers bloom in parks and gardens, city streets bustle and public swimming pools are packed. Trams and flying boats are a reminder of a by-gone era in the city's transportation while a rug factory is a colourful if unexpected inclusion. Last stop is a visit to Kawau Island — home of Governor Grey's Mansion House — where the sun also shines and aquaplaning, sports and bush walks are the order of the day. This was the 24th edition of New Zealand Mirror, a National Film Unit series promoting NZ to British audiences in the 1950s. 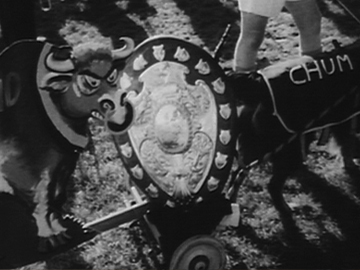 The first clip, on rugby's Ranfurly Shield, was deemed “too topical” by the UK distributor, and cut from later editions. The clip in question captures the colour of the national obsession (knuckle bones, livestock parades) at Athletic Park, where Taranaki challenge shield holders Wellington. It was later seen in NZ theatres as a short, playing with 1982 rugby tale Carry Me Back. The latter segments show Kaiapoi ploughing, and Wairakei thermal energy. This June 2013 edition of the TVNZ Pasifika youth show is presented by actor Robbie Magasiva from his base in Melbourne, where he has a role in Australian prison drama Wentworth. 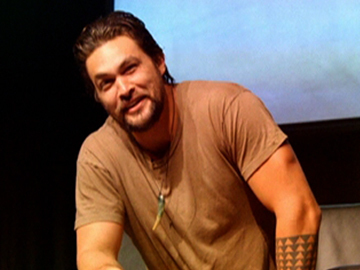 Elsewhere the Poly-plethora includes a visit by Pani (Goretti Chadwick) to Armageddon Expo in Hamilton to meet Game of Thrones actor Jason Momoa. Pani makes the hard man with Hawaiian heritage blush, and gets the lowdown on his mako tatau. Niuean artist Kenneth Green also talks about his tattoo; Tiger and Raa visit the school principal; and reggae band Brownhill close with ‘First Love’. This NFU public safety film takes a jaunty approach to a serious subject as it shows road crossing dangers via bad examples. Mis-steps include walking off the footpath carelessly, crossing the road at oblique angles, 'dithering', and over-confidence. The humour may be physical and the narration pun-filled, but the lessons remain relevant, as pedestrian accidents on Wellington's and Auckland's 21st Century city bus lanes attest. Despite the big question promise of the title there is no Socratic dialogue about crossing the road or any consideration of chickens. 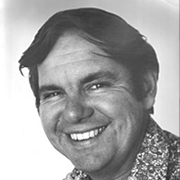 Merv Smith, QSM, hosted a top-rating 1ZB breakfast radio slot for 26 years. His on-screen work also spanned decades. In 1957 he was part of a public demonstration of the new medium of television. After TV launched locally in the 1960s, Smith hosted variety shows and read news reports on the Wahine disaster. In the 70s he hosted game show Pop the Question and acted on The Mackenzie Affair (as a sheep rustler). Alongside work as a narrator, he lent his voice talents to award-winning short Aphrodite's Farm, and animated shows Buzzy Bee and Friends and Buzz & Poppy. 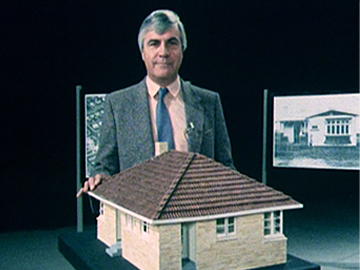 Smith died on 24 September 2018. He was 85.